Pure Naçional, a rare and exotic cacao long thought to be extinct, has been discovered in a remote region of the Peruvian Andes. With its complex floral and fruit flavors, Pure Naçional dominated the world's fine chocolate market until it was destroyed by disease in 1916. The legendary cacao was thought to be lost forever until only 23 trees were found growing in a remote Marañón River canyon with walls towering to 6,000 feet, creating a unique micro-climate that allows this cacao to thrive at previously thought to be impossible altitudes. But most importantly, these trees produce pods with a very rare mix of white and purple beans, and in many cases, all white porcelana beans. Stunned by this finding, samples were sent to the USDA and independent laboratories for DNA analyses. 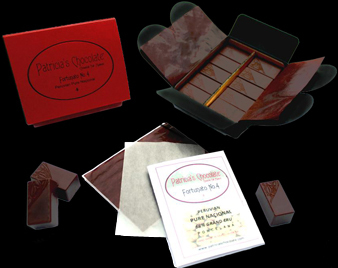 It was the 4th of these samples that confirmed the authenticity of the genotype as the strain of cacao from which all others descend ~ that is, the mother of all cacao ~ Patricia's Fortunato No. 4 is made from these precious beans. Named for the farmer who owns the isolated land where the trees grow, hand picked Fortunato No. 4 beans must be brought to fermenting and drying areas first by foot, then by burro, to motorcycle, and finally by all terrain vehicle. After years of site visits by specialists and over eighty drying and fermenting trials, the proper processing technique for the rare porcelana beans was determined, and the beans were brought to a renowned Swiss chocolatier able to use a special, very old conching machine to grind the beans in a manner that preserves the nutty, floral, and tropical fruit of Fortunato's terroir ~ the unique flavor profile that comes from it's soil. For more information about the finding of Fortunato's Pure Naçional, including videos of the farm, interviews with the discoverers, testimony from members of the scientific community, and links to worldwide press coverage please click here. Fortunato No. 4 is sold in an elegant gold lined box holding ten 8gm ingots and encased in a stunning red sleeve.